The buildup of beta-amyloid protein in the brain is considered to be one of the hallmarks of Alzheimer's disease. (The other major hallmark is neurofibrillary tangles.) These beta-amyloid proteins clump together to form insoluble (not able to be dissolved) plaques outside of the neurons. Beta-amyloid proteins also build up at synapses and interfere with communication from one cell to another in the brain. 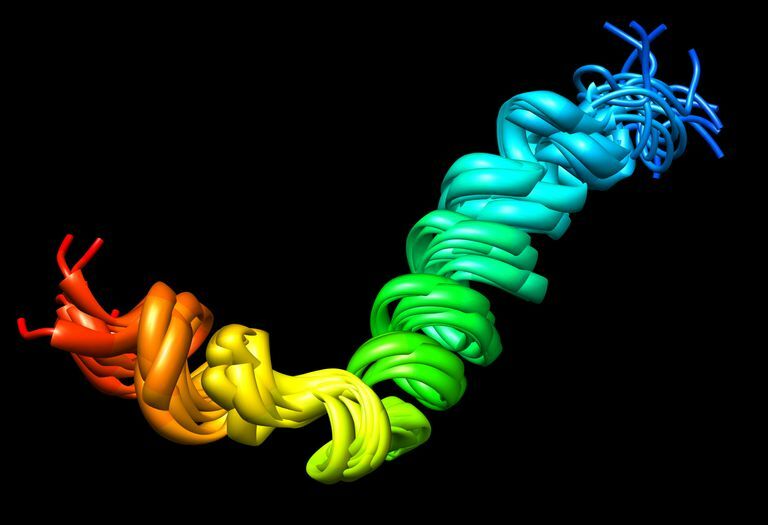 Before a cluster of beta-amyloid is large enough to be called plaque, these proteins first form oligomers. Oligomers are still soluble (able to be dissolved), smaller groups of beta-amyloid. Although plaques have long been identified as one of the causes of Alzheimer's, researchers have recently called this into question, identifying the above-described oligomers as perhaps being one of the main culprits in preventing communication from cell to cell. One reason behind this is that some people have plaque build-up in the brain, yet do not have symptoms of Alzheimer's disease. Additionally, other research has shown that cognitive changes appear to begin before the beta-amyloid proteins from the larger chunks of plaque. Science discovered beta-amyloid proteins more than 100 years ago. They were first identified by Dr. Alois Alzheimer in 1906. Beta-amyloid is part of a larger protein called amyloid precursor protein. Interesting quote: "Many scientists also think that plaques actually may be a late-stage attempt by the brain to get this harmful beta-amyloid away from neurons" (Alzheimer's Disease Education and Referral Center). Research conducted at the UC Davis Alzheimer's Disease Center found that the immune system responded the same way to plaque as it did to bacteria, triggering inflammation in the brain that damaged neurons. Inflammation in the brain has been connected with Alzheimer's disease. Alzheimer's Association. Experimental Alzheimer Drugs Targeting Beta-Amyloid and the “Amyloid Hypothesis.” 2008. Alzheimer's Association. More About Plaques. The DANA Foundation. Amyloid-Beta ‘Oligomers’ May Be Link to Alzheimer’s Dementia. July 12, 2010. National Institute of Aging. Alzheimer's Disease Education and Referral Center. January 22, 2015. Stanford Medicine. Scientists Reveal How Beta-amyloid May Cause Alzheimer's. September 2013. UC Davis Health System. Alzheimer's-causing Amyloid and Bacteria Trigger Same Immune Response. What Is the Amyloid Cascade Hypothesis of Alzheimer's Disease?